Hayfield is the setting for the Sunday night television series “The Village” this is the second of four videos that we have filmed in the area. Hayfield is a lovely village situated below on the west side of Kinder Scout in the Sett Valley between the towns of Glossop to the north, Chapel-en-le-Frith to the south and New Mills to the east. The village was once a staging post on the pack-horse route across the Pennines from Cheshire to Yorkshire the route went up the set valley and over the watershed at Edale Cross, where the old stump of a cross still stands, and descended Jacobs Ladder into Edale. The village is now split into two by the A624 relief road which was built to ease heavy traffic that once ran through the narrow main streets. The west side of Hayfield grew with the arrival of cotton in the 19th century followed by the railway and has now extended down the Sett Valley merging with Birch Vale and New Mills. Edale built of local grit stone is set in a lovely position below Kinder Scout in The Dark Peak area. It gives its name to the valley in which it lies, between Mam Tor, Lose Hill and Kinder Scout. Edale Valley is a collection of farming hamlets or booths dotted along the valley which grew around the original shelters or boothies used by shepherds when tending their sheep on the hillsides, such as Nether Booth, Barber Booth, Ollerbrook Booth, Upper Booth and Grindsbrook Booth. Edale is the site of an historic cotton mill built in 1795 on the site of a corn mill and tannery. The mill fell into disuse around 1940 and was restored as apartments in the early 1970’s by the Landmark Trust who sold six of the apartments to fund the restoration and retained one as holiday accommodation. Edale car park has public toilets with disabled facilities and just a short walk away is Edale Station, the line was built in 1894 between Manchester and Sheffield. Edale has a cafe next to the station and a pub the Ramblers Inn just beyond the railway bridge. The small hamlet of Grindsbrook Booth has a pub the Old Nags Head, a post office/general store, an early 19th century school and a late 19th century church. Next to the post office is Coopers Campsite for tents, caravans and mobile homes. The Fieldhead Campsite between Edale and Grindsbrook Booth taking tents only is owned by the Peak District National Park Authority and is situated at the Moorland Visitors Information Centre. Upper Booth is also a small hamlet with a campsite and camping barn called Upper Booth Camping taking tents, caravans and mobile homes. 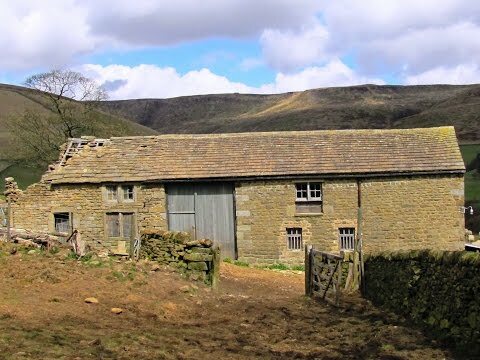 It is situated on a working farm on the National Trust’s High Peak estate in the western end of Edale alongside Crowden Brook which tumbles down from the Kinder plateau. There are also a few B&Bs, some holiday cottages and the two pubs have accommodation. These are all great places for exploring the hills and moors of the High Peak. The Old Naggs Head, once the village blacksmiths dating back to 1577, is the official start of the Pennine Way. The Pennine Way often referred to as the back bone of England is 268 miles long and heads north along the Pennine Hills passing through the Yorkshire Dales and the Northumberland National Park ending at Kirk Yetholm just inside the Scottish Border. The Pennine Way, very popular with walkers for many years, has 535 access points where it intersects with other public rights of way and crosses many roads and passes through many villages and towns with good public transport making it easier to be able to do long or short walks. The Pennine Way is not accessible to cyclists or horse riders but the more or less parallel Pennine Bridleway is open to all except motorised vehicles. Rushup Edge is a ridge overlooking the Edale valley towards Kinder Scout. Its highest point is Lords Seat, a round barrow, at 546 metres (1719 feet) which is a hemispherical mound of earth and/or stone raised over a burial placed in the middle. Mam Tor at 517 meters (1696 feet) lies at its eastern end beyond which the Great Ridge runs. The summit of Mam Tor is encircled by a late Bronze Age and early Iron Age hill fort. The Great Ridge is a ridge which runs for about 2 miles separating the Edale and Hope valleys. Kinder Scout at 631 metres is the highest point in the Peak District and is a high windswept upland grit stone plateau which rises steeply from the surrounding ground and the edges are studded with rocky outcrops, crags, boulders and large stones that are very interesting due to some of their shapes that resemble animals, fish, people and many other objects putting the imagination into over drive. We park in Edale car park and turn right following the road going under the railway bridge and past the Ramblers Inn until we reach Grindsbrook Booth. We turn left at the signpost and follow the Pennine Way to Upper Booth 1¼. Eventually we walk uphill through some mounds then downhill following the track which leads us through a farm yard at Upper Booth. At the road we cross straight over, telephone box on the left, and head downhill to cross the bridge over the small river then uphill to cross a stile. We then follow the public footpath sign post for Chapel Gate & Rushup via Dalehead. We bear to the left of a farm and head across the field to the run down Tagsnaze Farm which was used as the setting for the Middleton’s Farm in the television programme The Village. From here we head forwards through the gateway with the wall on our left. After passing two building on the left we go through the gate and head forwards until we reach a small bridge and a building. We cross the bridge and turn right in front of Dalehead Bunkhouse with shelter/information barn. Just past the buildings we go through the gate and turn immediately left and follow the path across the field. We cross a stream and then start heading steeply uphill to Rushup Edge. When we reach a track we turn right signposted Chapel-en-le-Frith and walk forward along the top then when we reach a wall in front of us we turn left and head forwards slightly uphill following Rushup Edge with the wall on our right. We pass Lord’s Seat at the summit then start heading slightly downhill until we come to Mam Tor the hill we can see in front of us. Here we start going downhill quite steeply to the road below. At the road we turn left then cross the road to take the gate on the right. We head forwards downhill on the footpath following the wall on the left until we reach a gate and a tarmac track on the left. We go through the gate and turn right and follow the track until we reach the road then turn right for Edale car park. This is a moderate to hard walk on good footpaths and tracks with some minor road. There are some inclines and declines with one really steep ascent from Dalehead to Rushup Edge. Approx 6.5 miles allow 3 hours using OS map OL1, The Peak District. Dark Peak area. Start Point: Edale pay and display car park £5 all day. Edale is in the Dark area of the Peak District. From Sheffield take the A57 towards Glossop and then turn left at Ladybower Reservoir on to the A6013. On reaching a main T-Junction turn right on to the A6187 towards Hope and Castleton. At Hope turn right along a small road sign posted Edale for approx 5 miles and the Edale car park is on the right. At busy times there is additional parking near the station which is provided by the Parish Council. There are public toilets in Edale car park and for refreshments there is the Penny Pot Cafe next to Edale Station and the Ramblers Inn just beyond the railway bridge. At Grindsbrook Booth there is the Old Nags Head pub and also the combined Edale post office and general store.